Have you tried fad diet after fad diet, only to gain weight back? Maybe you've tried the protein diet only to move on to vegetables only? Raw almonds and coconut water every forty-five minutes instead of big meals? Or perhaps you've tried counting calories, but the numbers on the scale still don't add up. If you are ready to throw in your hat and give up on dieting for good, take heart. You can enjoy food again—you just need to pay attention to your body's natural hunger cues. Based on the authors' best-selling book, Intuitive Eating, this workbook can show you how. 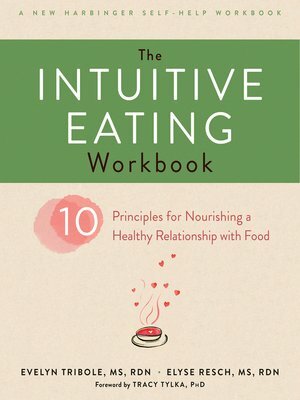 The Intuitive Eating Workbook offers a new way of looking at food and mealtime by showing you how to recognize your body's natural hunger signals. Structured around the ten principles of intuitive eating, the mindful approach in this workbook encourages you to abandon unhealthy weight control behaviors, develop positive body image, and—most importantly—stop feeling distressed around food!